With a population of 80 million, Egypt is the most populated country in the Arab world. And thanks to its large desert, most of those people live in large cities. Cairo is no exception. The average age for Egyptians is 25, and their growth rate is faster than ever. I asked Osama, our tour guide, why their growth rate is so high. He replied “The Answan High Dam, completed in 1971”. I figured the bus’ loud engines caused him to misunderstand my question. ..until he explained that more electricity means more clean hospitals and more clean water – hence lower infant mortality rate. Families accustomed to birthing 8-10 babies are now seeing them all survive to adulthood. According to the CIA World Factbook, Egypt’s population explosion is no trivial matter for their country. But it’s still not safe to drink the water. Even the luxury hotel bathroom has a “Do not drink the water” label near the bathroom faucet. You have to shower with your mouth shut tight and brush your teeth with bottled water. Or get sick. We saw the fallout of part of that population explosion when heading from the airport to the hotel. We passed a cemetery that was about 1/2 a mile wide and 3 miles long. 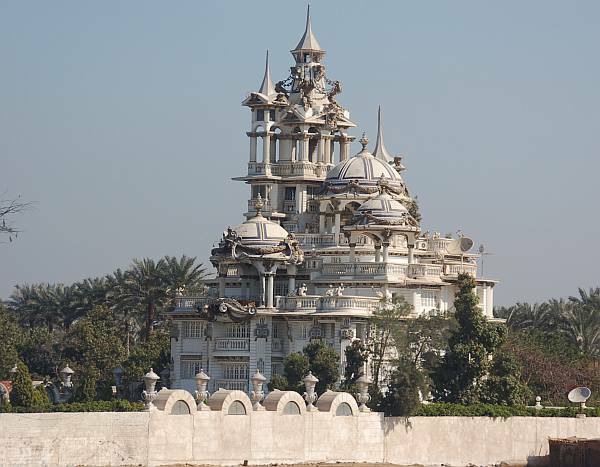 Osama pointed it out and called it the City of the Dead. The name is applied to five cemeteries in Cairo that date back to the Crusader era. 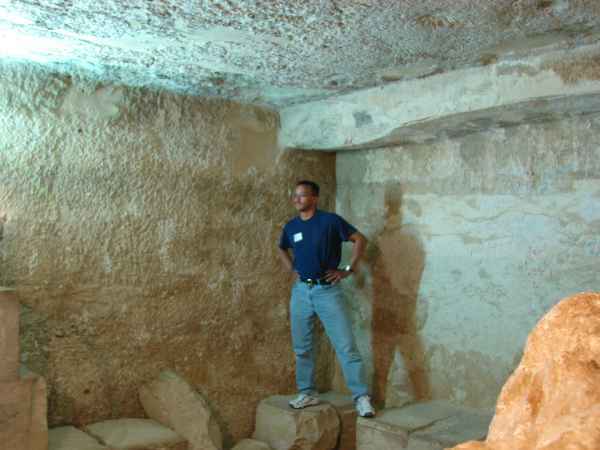 Egyptians were buried there, and above their graves are small huts where the family stays for the 40-days of mourning. Today’s homeless, on the other hand, say “Hey! Free housing!” They estimate some 20,000 people live in that one cemetery that Usama pointed to. 3 miles by 1/2 mile! 20,000 people!! Did I mention there’s no running water, sewer or electricity in those graveyards? 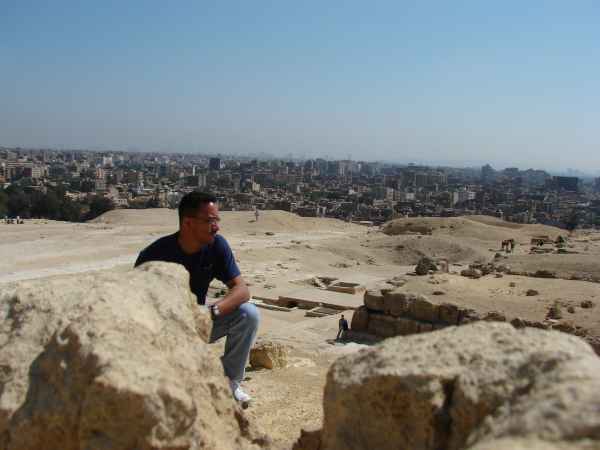 No one knows for sure, but estimates range from 500,000 to five million Egyptians living in all five cemeteries. Another fallout of Egypt’s population explosion is probably their 24-hr traffic jams. Check out this video on YouTube! Note the types of vehicles on the freeway (including donkeys pulling a trailer!) and how many of them don’t have headlights on! I didn’t take that video, but I kid you not, that’s exactly how it was, horns and all! Amazing that we didn’t wreck! 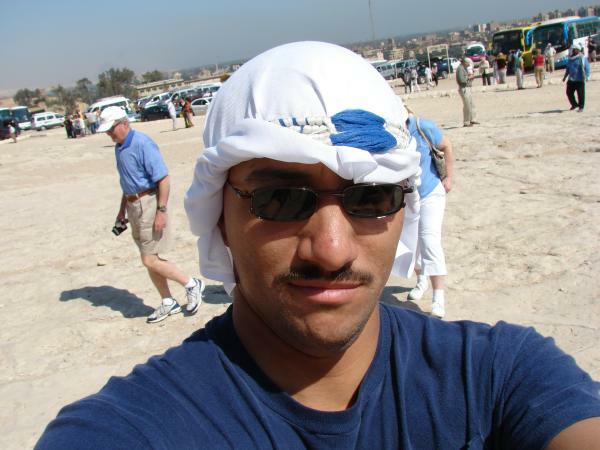 Egypt has lots of security. All tours are required to have a driver, a licensed tour guide and an armed guard. Even our hotel had guards at the front door and a metal detector. As we walked off the bus into the lobby, the bored guards just had us scurry past the metal detector, ignoring its incessant beeping at us. “It’s ok. Come, come. Quickly. It’s ok. Quickly! Come. Come.” Till they saw me. 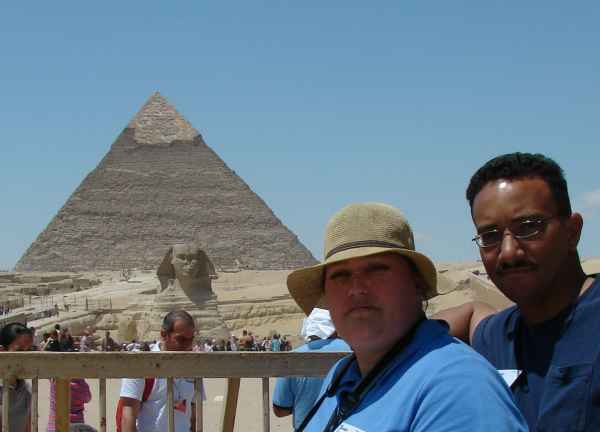 Did I ever mention the pyramids were huge? Did I ever mention that this pyramid was HUGE? 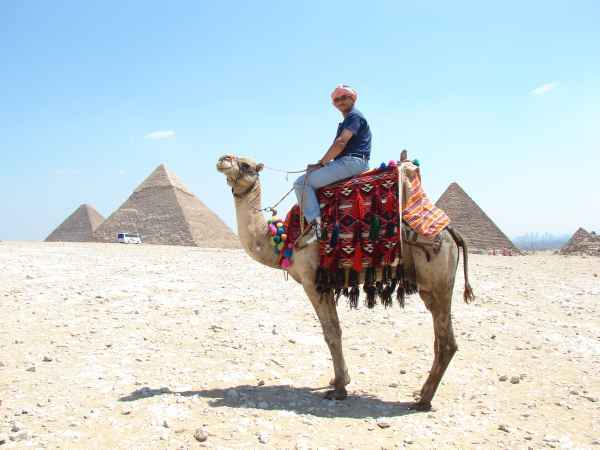 There are about 80 pyramids in Egypt, but not all of them are big. 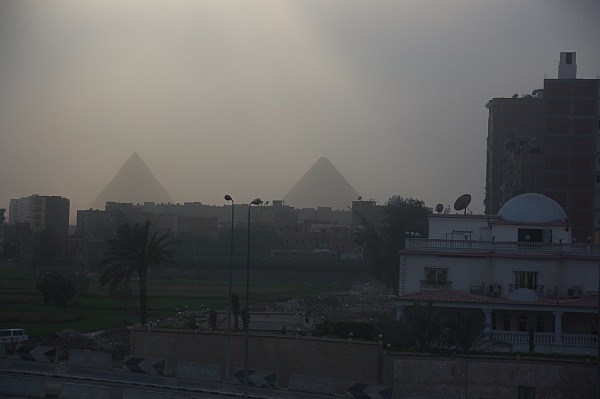 This is the Great Pyramid of Giza, built by Pharoah Kufu around 2500BC (about 400 yrs before Abraham). It’s basically one big tomb. A HUGE tomb! It’s withstood the test of time because it’s made of limestone, basalt and granite! Each of the limestone blocks pictured here weighs upwards of 3 tons. And there’s about 2.4 MILLION of these blocks!! The larger basalt blocks used for the foundations weigh up to 60-80 tons each, and they were brought here from 500 miles away. What nutty people! Why not just build the pyramid where the stone quarries are located? Duh! Less work!The higher quality limestone casing (totally removed from this pyramid) weighed upwards of 15 tons each. Thankfully, they were only hauled in from a mere 20 miles away. I mean they’re REALLY HUGE! Despite the limited technology of the workers, they were able to build a 450′ tall structure (world’s tallest till 14th century AD!) with each side 756′ long and no more than 8″ off true square. Most modern carpenters can’t do that! The base foundation is essentially perfectly square (your house’s foundation, much smaller, is not!). The longest interior passageway is so smooth and precise, that even at over 320′ long, it deviates from being truly straight by less than 1/2 an inch!Egyptologists differ in their estimates, but they figure around 40,000 people worked for 10 yrs to build one of these things. Note that if the dates are correct, the children of Israel did NOT build the pyramids. 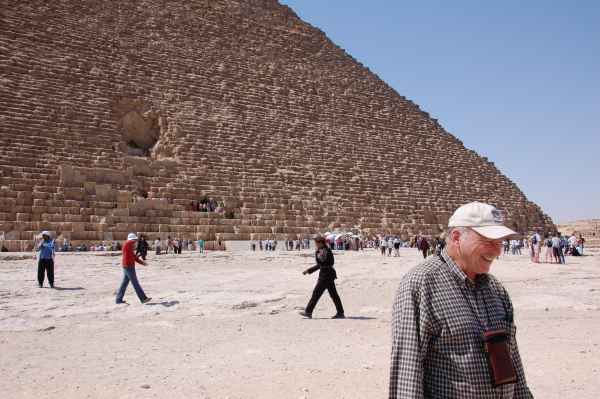 When Abraham visited Egypt in Gen 12 to escape the famine (and pick up Hagar), the pyramids were already 400+ years old. Moses wouldn’t ask Pharaoh to let his people go for another 450 years. When we got there, the electricity was off (and you thought these things didn’t use electricity! ), so we had to wait before going in. I decided to hike around. Smart guy. I gave him $1. Here’s the inside of the lady’s tomb. The stone is nowheres near as smooth as the granite in the big guy’s tomb. I guess she wasn’t as important or something. 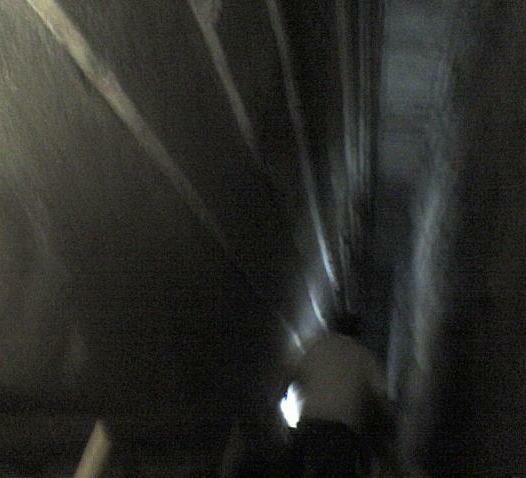 The main attraction of the innards of the Great Pyramid is the King’s Chamber. Actually, it was the only one we were allowed to see. We weren’t allowed to bring cameras inside. We entered through a rough-hewn passage that was cut below and to the right of the opening of the Descending Passage (large diamond shape opening on the face of the pyramid) that joined the bottom of the Ascending Passage. 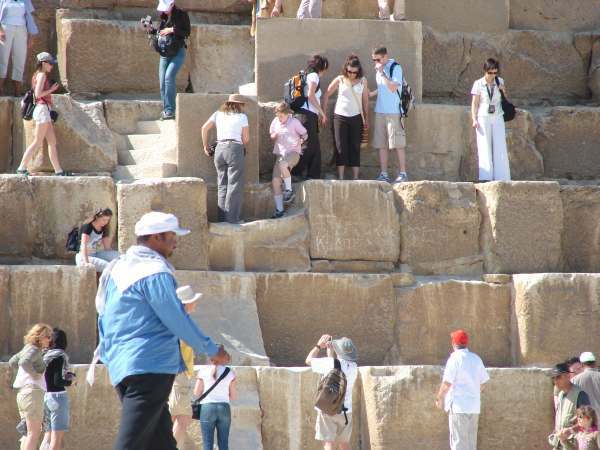 The passages are lined with smooth granite with no mortar (the bulk of the pyramids are made of limestone), and the seams of the granite run parallel (and perpendicular) to the angle of the shaft. The stones are cut so perfectly square, you can’t put a razor blade between any of the stones. The Ascending Passage is about 3′ wide and high. You have to climb hunched over, in single-file to make it to the Grand Gallery. If you look at a diagram of the pyramids, you realize that the entire thing is nothing but a pile of stones. There’s no big room inside it. The diagram I have here is not to scale – the king’s chamber is not more than about 20feet x 20feet, although the base of the pyramid is over 750 feet on each side. Here’s one weird thing: for years, people have believed that the tubes leading from the chambers were air shafts – until some enterprising mathematician calculated that back in 2450BC, they pointed directly at certain stars. Did I also mention that the pyramids of the Giza plateau, when seen from above (like, for example, from a flying saucer) are built in such a way that they match the stars of the Orion’s belt, exactly to scale, both with respect to distance from each other as well as size, with the Nile where the Milky Way would be? I kid you not! Google it. The Grand Gallery is tall enough to walk upright. Thankfully, both passages have wood ‘ladders’ laid on the floor so you can climb w/o slipping. It’s a pretty good workout to make it to the King’s Chamber. I don’t know why the guy let me take my cell phone in without asking whether it had a camera on it. You practically had to beat them back with a stick if you wanted them to leave you alone (and some tourists did!) I just joked around with my guy and eventually gave him $1. He thought I was cheap. Dunno why. 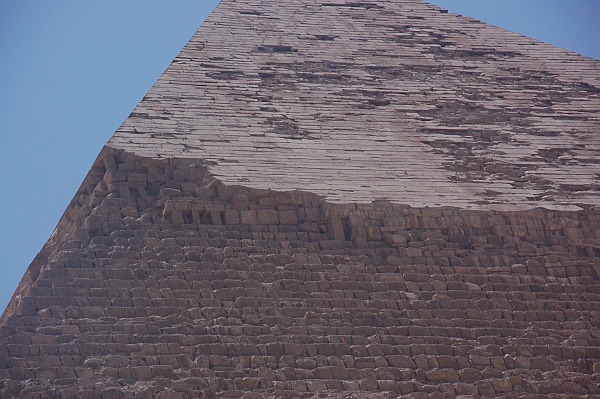 A closeup of Khafre’s limestone top. 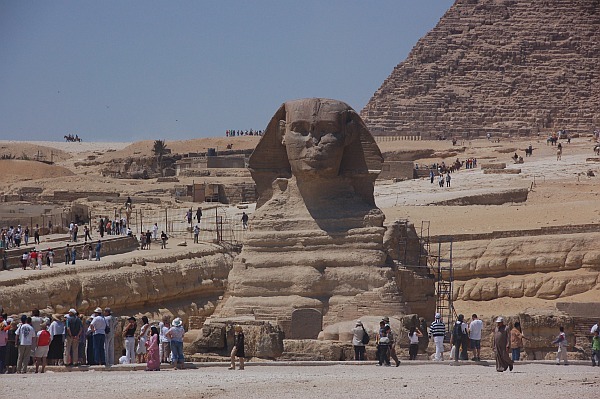 Sitting east of Khafre’s pyramid is the Great Sphinx. It remains one of the largest single-stone statues built by man. It was built shortly after the pyramids and then covered up by the sands of time.However… several hundred years later, Thutmose IV, the Pharaoh that reigned in the wake of the Exodus wrote an inscription in stone and placed it in front of the Sphinx. It describes why he uncovered the Sphinx and admits, among other things, that he was not meant to be Pharaoh (gee – could it be because his older brother was the first-born, killed in the 10 Plagues!?) More on that later. Here’s our Mr. Sphinx with the Dream Stele written by Pharaoh Thutmose IV (inscription saying “I wasn’t supposed to be Pharaoh…”) sitting between his paws. 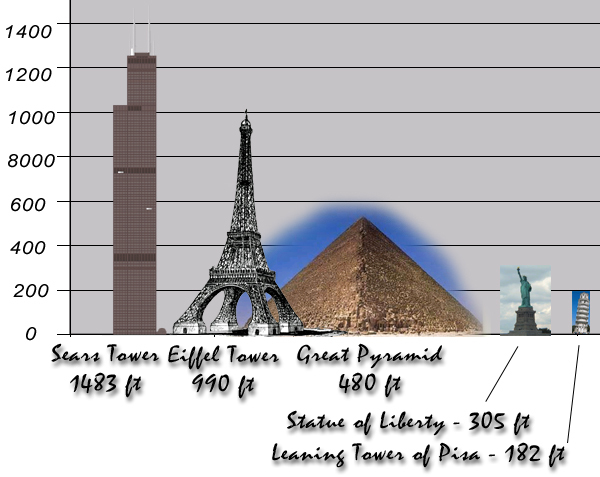 Just to give you an idea of how insane the place is, here’s a comparison chart. We also went to the Step Pyramids. I forget how they’re connected to the Bible. 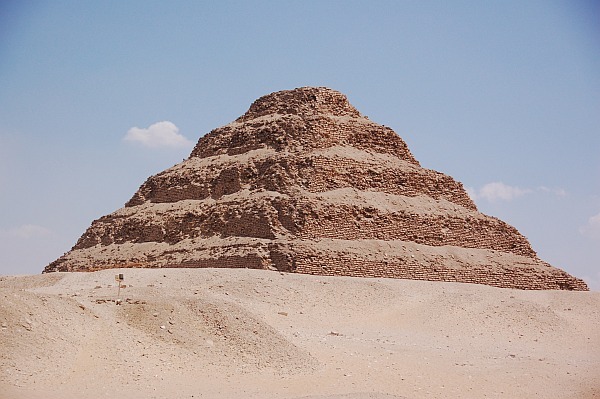 They’re the oldest buildings in the world that are still standing today.We didn’t go into the pyramid, but we did check out Phah Hotep’s tomb, located nearby. Cameras weren’t allowed inside. The guy working the tomb kept trying to get me to give him $1 so I could use my camera. He just wouldn’t accept my quarter. Dunno why. Another guy in our group was just taking photos willy-nilly. I guess he paid his $1. The clarity of the cell phone camera isn’t the greatest, but .. I guess it’ll do. For now.We also went to the Cairo Museum. No photos allowed there either. Bummer! King Tut’s goodies were on display there. 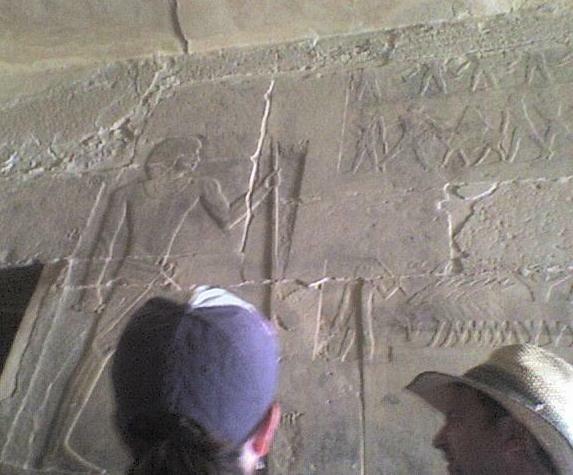 We saw an Egyptian stele (big rock with hieroglyphic writing on it) that specifically mentions the Israelites. It’s called the Merneptah Stele, and is the earliest non-Biblical mention of the Israelites. In the Stele, the Pharaoh Merneptah (son of Ramses II) celebrates his victory against the Libyans and their allies. In the last few lines, he cursed the Israelites and said their “seed is no more”. Do tell?? But God said that Abraham’s seed would be blessed and like the sand. It would appear we have conflicting omens here. Darn… Whom to believe: Pharaoh, God; Pharaoh, God. A windstorm hit Cairo one day while we were there.Regardless of the relative wealth of any given neighborhood, you could always find a TV satellite dish. Most homes had rebar sticking out of the top floor (far right). When a son marries, he builds on top of his dad’s house and moves in with his wife. You could have several generations in one building, holding dozens of individuals. 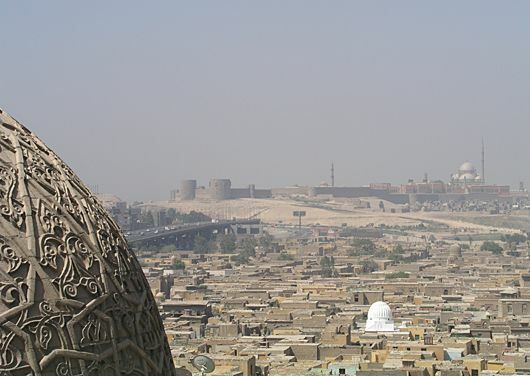 Here’s Sufihostel, Sultan al Ashraf Barsbay, 1432 (dome on the left) overlooking the City of the Dead. If you don’t know what the City of the Dead is, re-read the 3rd paragraph at the top of this page. You can actually take a tour of the City of the Dead. For obvious reasons, make sure your guide is VERY familiar with the area.In the background is The Citadel, a fortress built around 1180 by Saladin (one of the main guys in the movie “Kingdom of Heaven” by Ridley Scott). He built it to protect Cairo from the Crusaders. In 1355, Mohammed Ali (not the boxer) built a mosque there. Here’s a video of a Rug-Making School in Cairo.